The form of thy body will be changed as was mine. And what I now am, thou wilt be in the future. Now I am ashes and dust, and food for worms. Than of thy body, because that survives, and this perishes. This tomb holds me: Thine will be equally small. Which soon in the dust the hungry worm will devour? So also thy flesh and all thy glory perish. My name was Alcuin, and wisdom was always dear to me. Pour out prayers for me when thou quietly readest this inscription. 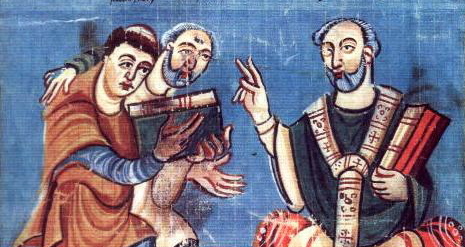 Alcuin did show himself to be one to whom “wisdom was always dear.” He was in the early wave of scholars who were gathered to the court of Charlemagne to undertake a program of educational reform and improvement. Alcuin was primarily a theologian, and wrote volminous Bible commentaries, and works in defense of the Trinity and against a new Spanish version of the adoptionist heresy. But as an educator and a man to who “wisdom was always dear,” he also branched out to instruction in the liberal arts. He invented that thought problem you’ve heard about the fox and the goose and the bag of corn that need to be taken across a river but can’t be trusted alone on one side of the river together. Where You Go When You Die.